AVA objectives are to safeguard and promote Australian core values which are universal values including democracy, rule of laws, freedom, equality, tolerance and human rights, irrespective of race, gender, different religions, political viewpoints, thinking and theories, etc. AVA welcomes all participants who embrace Australian core values and are willing to make an effort to safeguard such values. In recent years, Australia is increasingly facing the “red poison” from non-democratic countries through infiltration and intervention, and is causing increasing worry and discomfort by many Australian Chinese. In August 2016, some people, under the blanket of hidden power, intended to hold a “glorifying Mao concert” that contained “red poison” in both Sydney and Melbourne, in the name of celebrating the Chinese dictator and butcher Mao Zedong. 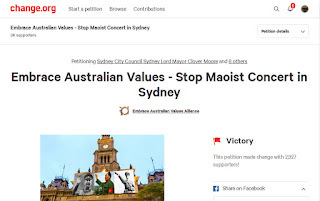 A group of Australian Chinese who supported Australian core values, initiated a group to resist this “Glorifying Mao” concert, leading to the establishment of an “Safeguard Australian Values Alliance”. They had successfully aroused a protest and rallied support from the Australian Chinese communities to insert pressure, in conjunction with the mainstream society and media, and had finally forced the organizer to cancel the “Mao Concert” in both Sydney and Melbourne. In later days, the Alliance organized a group to protest against and resist the poisonous “Red Detachment of Women” Ballet in Melbourne. It also organized the successful community seminar on “Resisting CCP infiltration into Australia. Times and again, the Alliance had contacted mass media and informed the public about the “Red” poison and its risks to Australia and our communities. Besides the Alliance has been endeavour to promote Australian core values in various groups and media and has received positive supports and responses from the mainstream and Chinese communities. Business Of Luxury Design I will try it.